Hi friends, whatever we have from other regional cuisine, our own regional foods are close to our heart, right? Mostly, we love to try and taste many varieties of cuisine from all over the world, but we would like to have our regional foods for routine life. 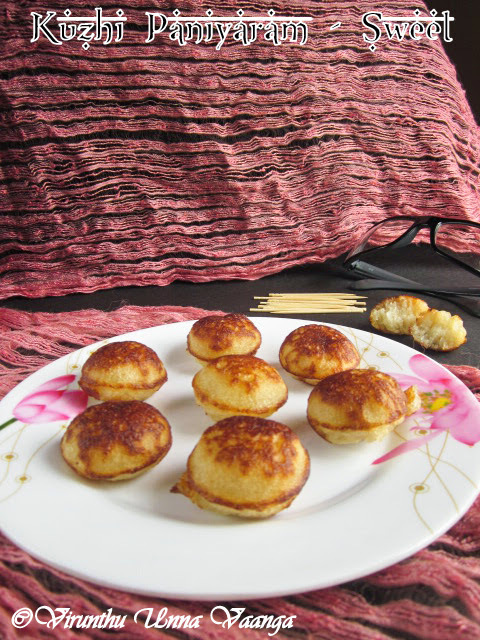 Today’s recipe is very traditional and signature recipe of Tamil Nadu... My most favourite one and nowadays, you can buy the cute paniyaram in hotels, street shops even some women are used to sell in front of their house (Idli-Paniyara Kadai) for morning and evening in remote areas or in some busy streets too. 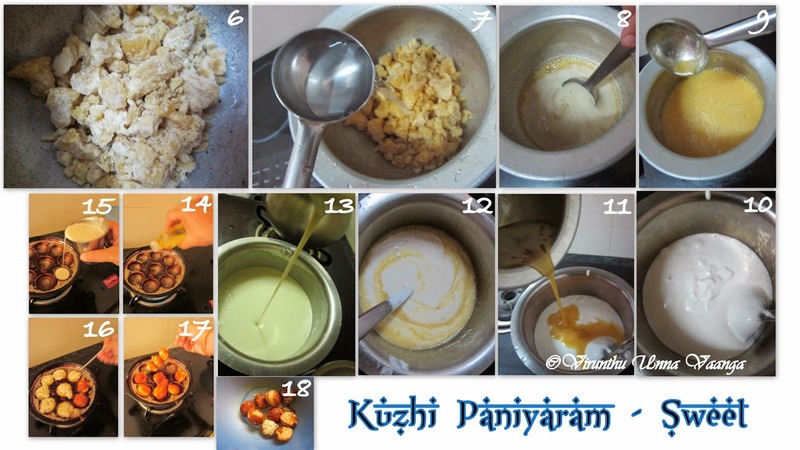 Traditional method of paniyaram with raw rice and parboiled rice (Pulungal Arisi) with some amount of fenugreek seeds, this was the basic ingredients to prepare batter and can make sweet and savoury with the batter. I love sweet version than savory. The paniyaram does not contain urad dal. The outer layer will be very crisp and inner will be soft with mild sweetness. Try once you will love it, its such a addictive food. 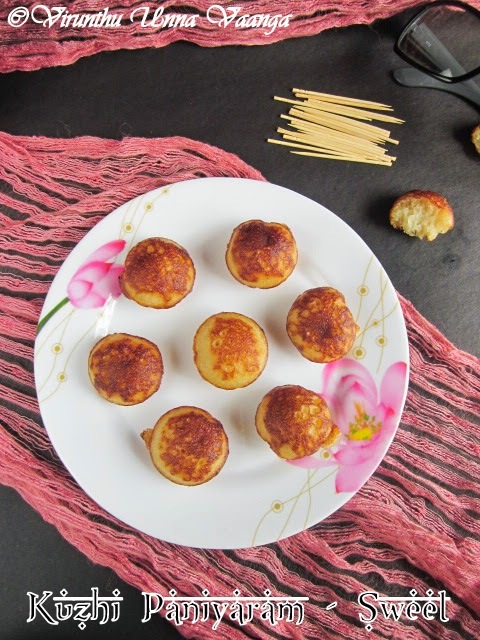 The traditional paniyaram recipe for Tamizhar Samayal Tuesday (TST) which is the brainchild of Nalini Suresh akka from Nalini's Kitchen. 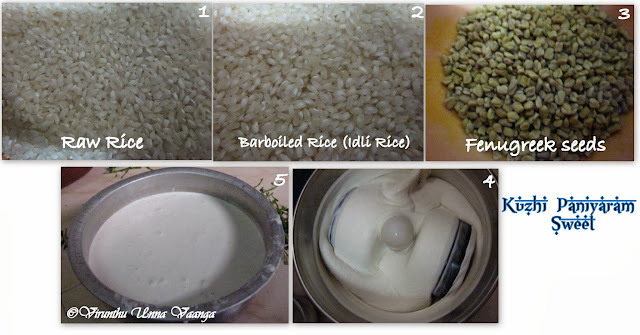 Soak the fenugreek and raw rice + parboiled rice separately for 2-3 hours. First grind the fenugreek with sprinkle of water then add rice mixture and grind into a smooth paste. Transfer the batter into the big bowl and add enough salt and mix it well by hands. Keep it for fermentation on overnight, and the batter is ready to make paniyaram varieties. 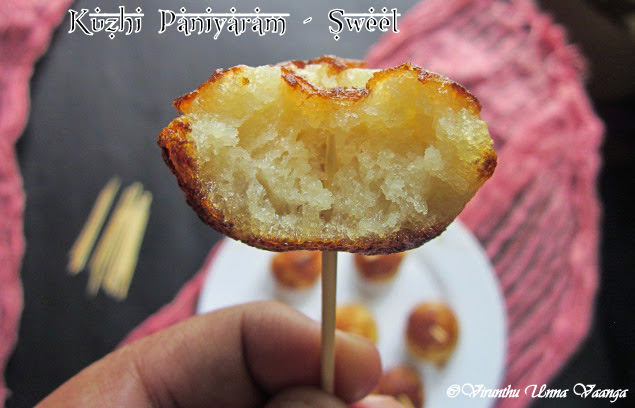 Take the required amount of paniyaram batter into a mixing bowl and keep it aside. Take the grated or small pieces jiggery add 2-4 Tbsp of water and melt it completely. Add the jaggery syrup into the batter via coffee filter little by little and stir it well. 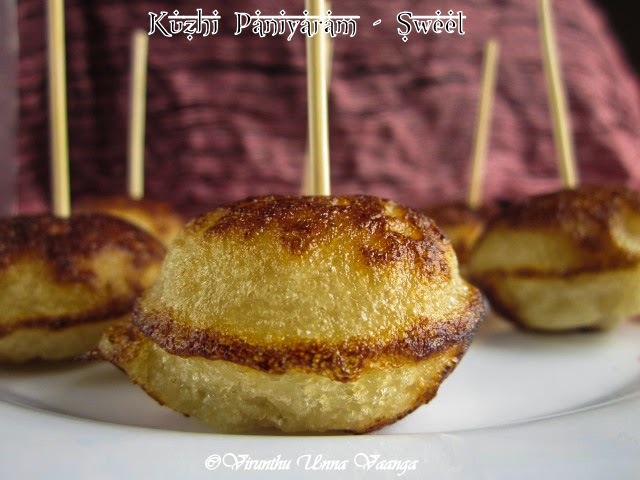 Check the sweetness of the batter and add according to your sweet taste, if not enough add little and mix it well. Heat paniyaram pan on low-medium flame. 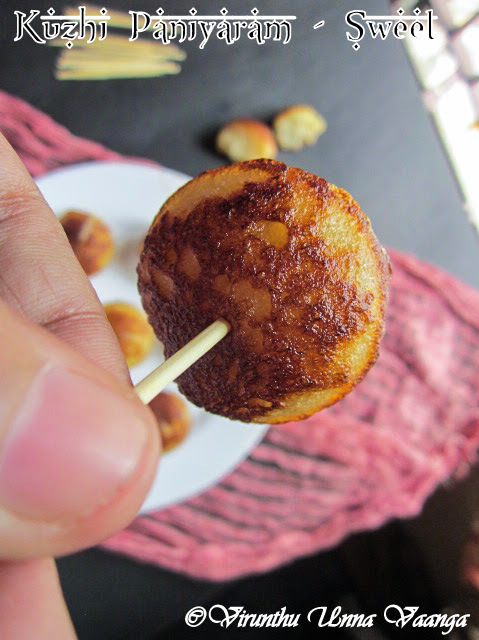 Add 1 Tsp of oil in every well of the paniyaram pan. 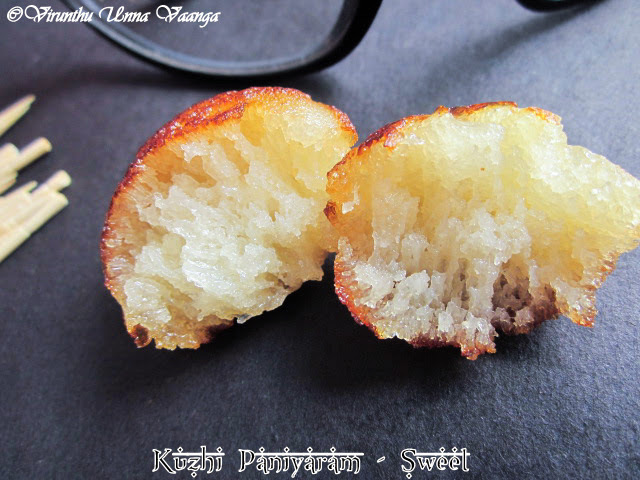 Add sweet paniyaram batter to the ¾ of the well, because it will rise while cooking. And cover with lid for 1 minute on low flame. 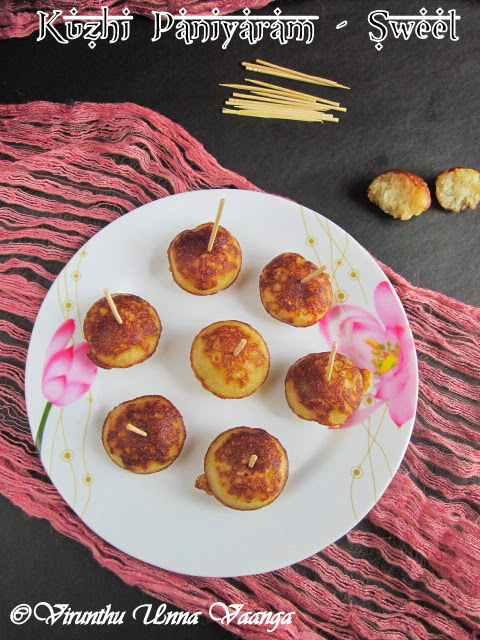 Now flip the each paniyaram with the help of skewer or wooden stick. After it gets cooked take out from the well and keep it in bowl. Serve it hot, if you wish serve with coconut chutney. 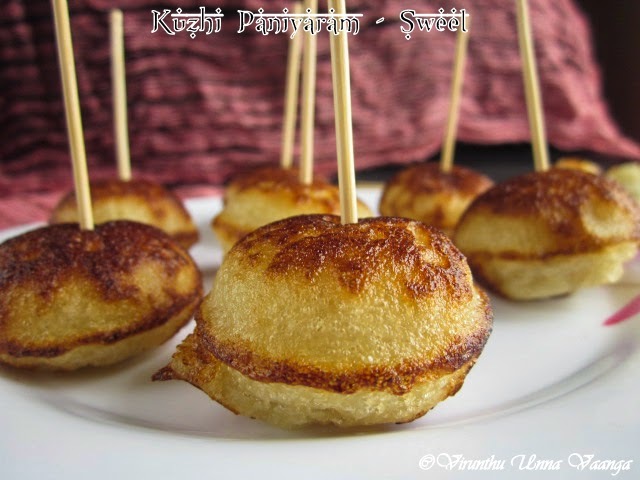 SOFT AND SPONGY SWEET KUZHI PANIYARAM!!! 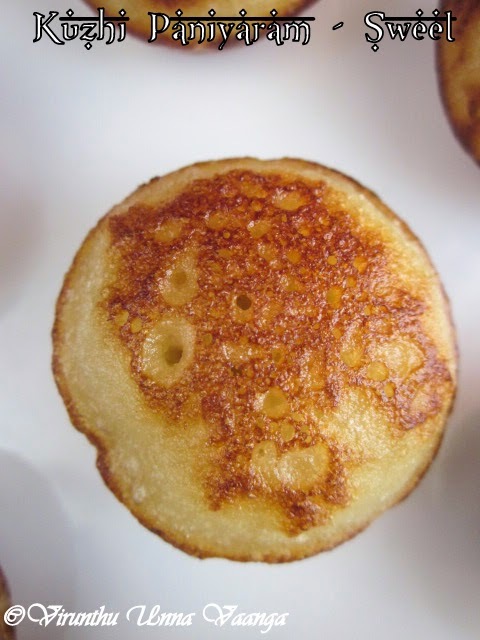 The batter will be very thick but don’t worry, when you add jaggery syrup it will be loosen. 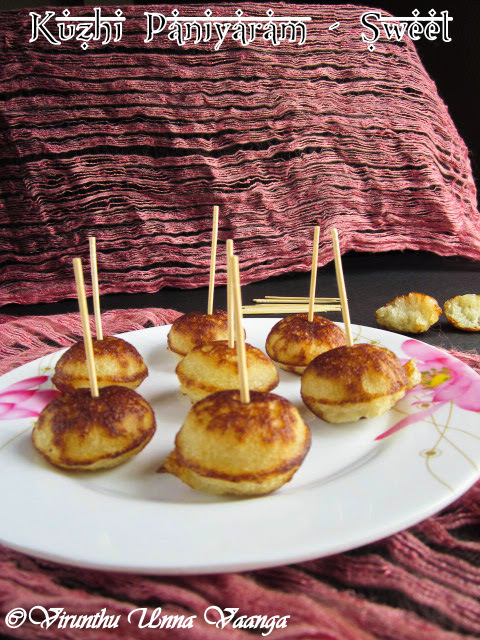 The batter consistency is important it should not be too runny; it should be like idli batter consistency. 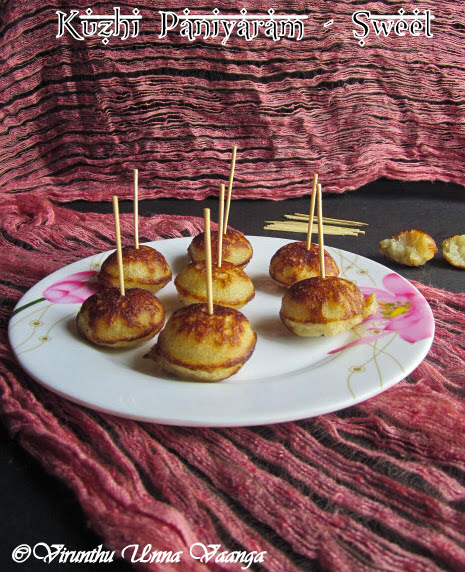 You can make spicy paniyaram by adding veggies with tempering. If you like palm jaggery adds it instead of jaggery. ENJOY EVERY BITE OF THE DELICIOUS AND TRADITIONAL PANIYARAM!!! 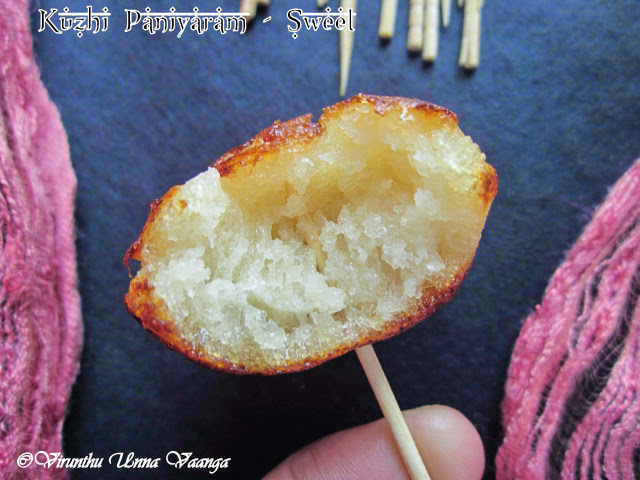 So soft and delicious paniyaram. 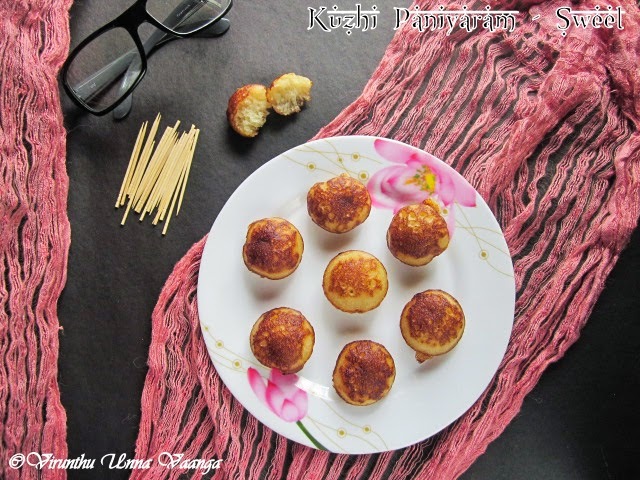 Love these paniyarams da.. Looks so delicious..
What makes the batter to ferment without urud dal?